Thread lift is a non-surgical procedure during which facial and neck skin is tightened with the help of fine surgical threads. Thread lift leaves an effective and natural result, yet lasts for shorter periods compared to surgical facelifts. Thread lift has the advantage of small scars and short recovery. At the end of the work week the face is tightened and in the beginning of the next one You can already return to work with a new face. This is why thread lift is often called a “weekend facelift”. The amount and location of the threads depends on the skin’s conditions and the placement of threads is individual. Christinas Clinic uses the products of Silhouette. Silhouette‘s threads are inserted 3-5mm under the skin with a needle. The beginning and end points of the thread mark the angle of the lift. Special cones are attached to the threads to anchor them to the soft tissues and create the necessary tension. Two different types of threads are available: Silhouette Soft and Silhouette Lift. Silhouette Soft is the less effective of the two, but its advantage is stimulating the natural production of collagen. These threads will absorb with time. The effect lasts for about 2 years. Silhouette Soft is recommended for patients with thinner skin or less drooping skin. Silhouette Lift is stronger and has a longer effect. 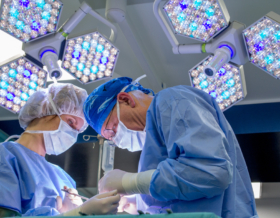 The cones attached to the threads will absorb in time, but the connective tissue that grows around them helps the threads stay in place after the cones have absorbed. 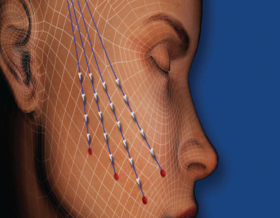 Silhouette Lift‘s advantage is the possibility of re-tightening the threads, and in this way prolong their effect. Silhouette Lift is recommended to patients who wish for longer lasting results and whose skin has moderate or major drooping. The effect of the threads can last 3-4 years. Take a look at our interview with Elve. Weekend facelift Today's pace of life requires equally prompt surgical solutions. Patients of aesthetic surgery simply cannot afford long recovery periods. 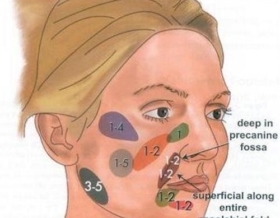 This also explains the growing trend at Christinas Clinic to place facial threads. Sagging facial skin - Which procedure is right for me? Some beauty procedures are so similar in nature and process that it becomes difficult to decide which is suitable for the individual patient’s face. Two procedures which both aim to fill sagging skin are injectable gels and fat transfer. This article aims to distinguish this process, and help you determine which is best for you. https://www.christinasclinic.ee/wp-content/uploads/taitesustid.jpg 510 500 Ingrid https://www.christinasclinic.ee/wp-content/uploads/Christinas-Clinic-LOGO.png Ingrid2015-03-09 15:01:592017-10-19 15:53:10Sagging facial skin - Which procedure is right for me? Weak facial muscles may not necessitate call for a facelift. A suitable intermediate option is the addition of surgical threads, which enhance the facial muscles and subcutaneous tissues. Facelift should be considered only when excess skin appears. As time passes, your nose stretches and grows bigger and bigger visually. 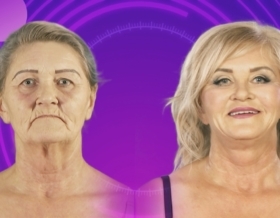 When cosmetics just aren’t enough for those wrinkles any more, many women turn to injections. Instead of starting by filling in one wrinkle, Brit-Carmen Norlan, Manager of Christinas Clinic, recommends a full assessment and treatment plan for the face. This gives a better overview of the techniques that may give better results in the long run. Take a look at our interview with Ulvi.